The reduced size and practicality of this machine, make it ideal for digging potatoes, and other tubers in small acreages. It is especially efficient in sandy soils. 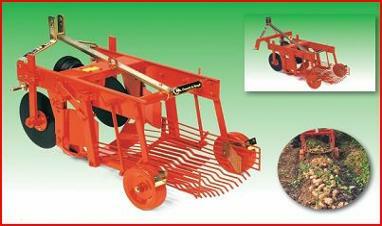 The SPV 50 V potato lifter is equipped with discs and a vibrating shore helps penetrate the soil. The machine offers an initial separation of soil from potatoes, conveys the products to a sieve , which separates them by shaking. This unit does a particularly good job on new potatoes. The SP 50V must be applied to three-point linkage of tractors. The SP 100 potato lifter has been designed for digging potatoes or other tubers from any kind of soil, even on heavy gradient land. The machine is equipped with two alternately-oscillating sieves, which shake the dirt off of the potatoes and deposit clean potatoes on the ground in a single row. The shaped share and front conveyor discs allow SP 100 to work even around very leafy crops and in weed-infested areas. 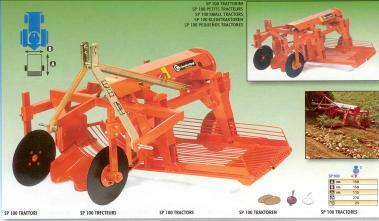 The S 100 must be applied to three-point linkage of tractors. The Crop Care Picking Assistant is designed for small to large scale crop harvesting, weeding, planting and bed maintenance. The deceptively simple design increases the efficiency of field work and keeps workers going strong through the day. Now you can minimize your harvesting losses for crops with a short picking window. 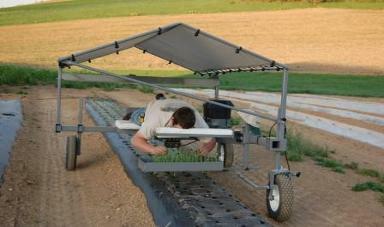 The low cost investment in the CropCare Picking Assistant will quickly repay itself with increased profits.